Taffeta skirting / stretch velvet top / tulle-net hem. Excellent- see taffeta pin issue. All clothing must be free of major defects. We never knowingly misrepresent anything. We do our best to describe color, but many computer screens display colors differently. 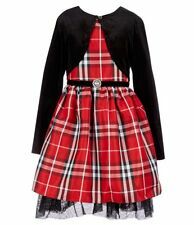 Skirt and skirt lining - 100% polyester. Top half of dress is a soft, stretchy velvet like fabric. Skirt has appearance of a soft satin or tafetta. Machine wash and dry. Color: Ivory with glitter. Floral lace pattern on top. Long Sleeved. You will look beautiful wearing this too! 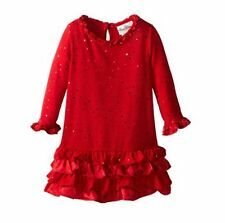 Your little Princess will look adorable in this gorgeous dress by Rare Editions. Features peter pan velvet collar, velvet floral details, and check pattern.Once worn, in excellent condition. Velvet Peter Pan Collar. THE TOP IS BLACK VELVETY TO THE TOUCH WITH LONG SLEEVES.THE WAISTLINE HAS A BOW WITH BEAUTIFUL BERRIES AND THE SKIRT IS 3 LAYERS OF MATERIAL WITH GORGEOUS BLACK BERRY BUSHES ON FRONT AND BACK. THIS IS BEAUTIFUL.